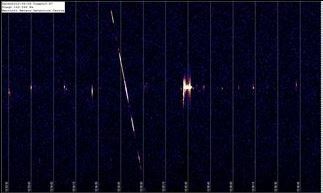 The blue base is the standard background noise level; the vertical, coloured strips are meteor detections. The successive red, orange, yellow and white colours indicate the strength of radar return. Detections showing yellow and white are the most intense. 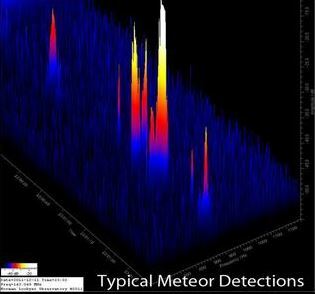 Vertical detections are from high speed meteors. Horizontal detections are from objects moving more slowly through the radar field of view. 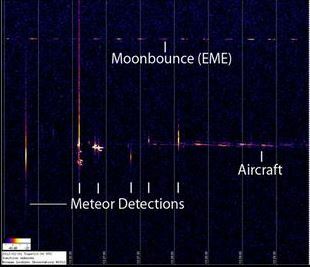 Our Moon (240,000 miles away) reflects radar signals back to Earth. The round trip takes 2½ seconds! That’s how powerful the radar is. The International Space Station orbits Earth every 96 minutes at a height of 250 miles and travelling at 17,500 m.p.h. The ISS is crewed by six astronauts, with the longest-serving two being replaced every two months, allowing for a maximum of 6 months stay for each astronaut. The diagonal line shows the ISS passing through the radar signal. The Space Race began in October 1957 when Russia launched Sputnik-1 into Earth Orbit, followed shortly by Sputnik-2. Since then, numerous satellites and rocket bodies have been launched into space. With the exception of satellites designed to leave Earth’s Orbit, everything that goes up must come down! 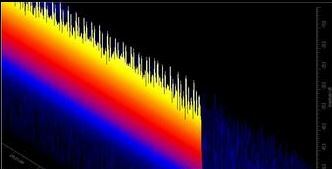 Radio waves generally above 50MHz are normally “line of sight”. On occasions, particularly due to weather conditions, radio signals are trapped between atmospheric air masses of different temperatures (known as temperature inversion), often during times of abnormally high-pressure weather systems, allowing radio waves to travel extreme distances, typically 1000 miles (1600Km) or more. 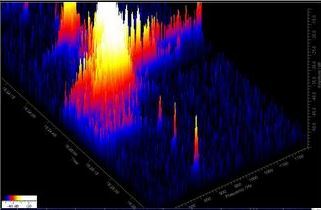 This phenomena is known as Tropospheric Ducting and can be clearly detected on our screens. The top image is the displayed “3D” image, and the lower image is the displayed “2D” image. These images are correlated with our satellite and ground station weather data. 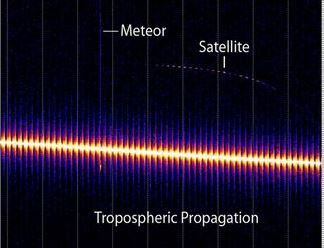 Read more how the meteor radar works.